Achilles tendonitis is a condition wherein the Achilles tendon, at or near its insertion to the posterior aspect of the calcaneus, becomes inflamed and causes pain. The Achilles tendon is one of the longest and strongest tendons in the body. It is avascular and therefore slow to heal. The Achilles tendon is formed in the lower third of the posterior aspect of the tibia. Two muscles join to form the Achilles tendon: the Gastrocnemius which originates on the posterior aspect of the femur, and the Soleus which originates on the posterior aspect of the upper third of the tibia. The Achilles tendon works as an anti-pronator. Patients complain of severe aching or burning pain felt in the back of the heel, which increases with passive dorsiflexion and resisted plantarflexion, such as rising up onto the toes. Over-pronation, overstress of the tendon. Risk factors include tight heel cords, foot malalignment deformities, recent change in activities or shoes. During a normal gait cycle, the femur and the tibia rotate in unison (i.e. internally during pronation and externally during supination). However, when a person over-pronates, the tibia is locked into the talus by the saddle joint and therefore continues to rotate internally past the end of the contact phase while the femur begins to rotate externally at the beginning of midstance. The Gastrocnemius muscle is attached to the femur and rotates externally while the Soleus muscle is attached to the tibia and fibula and rotates internally during pronation. The resulting counter rotation of the femur and the tibia causes a shearing force to occur in the Achilles tendon. This counter rotation twists the tendon at its weakest area, namely the Achilles tendon itself, and causes the inflammation. Since the tendon is avascular, once inflammation sets in, it tends to be chronic. Relieving the stress is the first course of action. Acute treatment involves ice therapy and activity modification. Active stretching and strengthening exercises will assist rehabilitation of the gastrocnemius-soleus complex. When placed in a heeled shoe, the patient will immediately notice a difference, compared to flat ground. It is recommended that the patient be fitted with orthotics to control the down-and-in movement of the talus and maintain proper alignment, relieving the stress on the Achilles tendon. 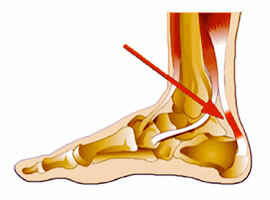 Tightness in the tendon itself can be helped by an extra heel lift added to the orthotics. The patient can expect a slow recovery over a period of months.